From the time my daughter was just a few months old, I can remember cuddling up in the rocking chair and reading to her — a tradition we would continue throughout the years. I wish these books were around then as the Sandra Magsamen Snuggle-Me Stories make moments like these even more memorable. The two titles, LITTLE BEAR HUGS and MY LITTLE MONKEY, come as small board books that are just the right size for babies and toddlers hands. 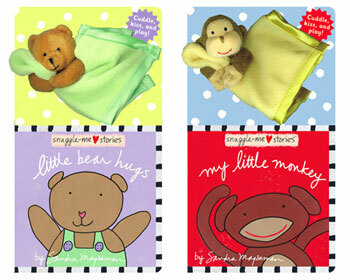 Each book comes with the perfect companion, a small plush animal attached to a mini blanket. Being able to physically hold and interact with the characters in the book make the story come alive, and these little characters are sure to become a baby’s favorite bedtime snuggly. The short rhyming stories are filled with cute, sweet and loving sentiments which make them the perfect gift for your own little one or the baby shower gift for someone special. Sandra Magsamen is an artist, mom, author of Living Artfully and creator of the Messages From the Heart brand. She designs gifts and ideas that encourage us to live with heart. Sandra Magsamen lives artfully with her family in the Maryland town in which she grew up. Please visit her online at www.sandramagsamen.com.